Ah to be sure, NextGen Gaming is a developing house that knows how to make deadly online slots. There is, of course, plenty of material in Ireland’s rich heritage and folklore as resource for any good developer. 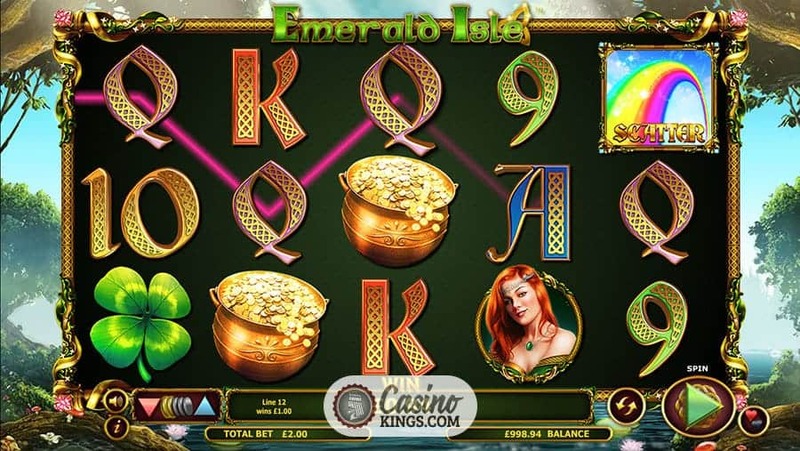 The Emerald Isle slot is actually a re-design and re-release of an earlier version. This one is with plenty of freshness brought to the slots table by a developer that knows its Guinness from its potato farls. First and foremost, what do we think of when we think of Ireland? Rolling green hills and meadows bestowed with a rural charm unlike any other? That’s exactly what NextGen delivers with superb game design and artwork. Matched perfectly with sweet birdsong and a lilting strings soundtrack that massages our ears and our sensibilities. Our high-paying gaming symbols are a Shamrock – naturally – a Pot of Gold – of course – and a beautiful Irish Maiden – wouldn’t have it any other way. 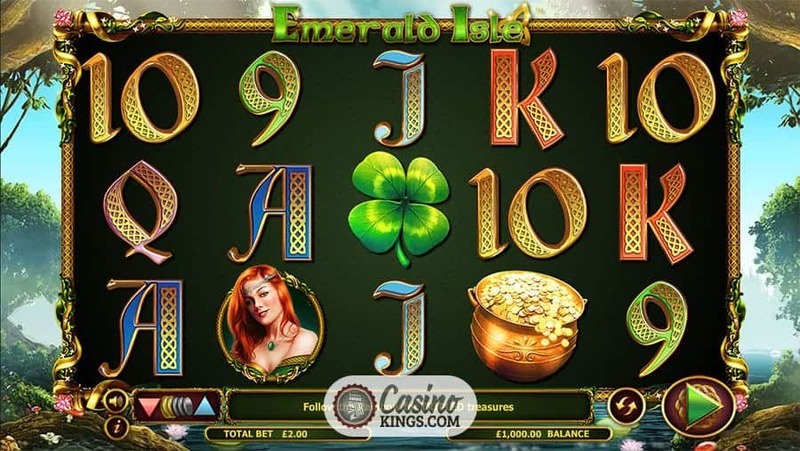 Our low-payers are Celtic styled 10s through Aces, delivering an excellent design flourish to even our low symbols, and our low-payers require three or more to form winning combinations while out top-paying symbols score wins when we match just two. The Leprechaun is our Wild symbol, appearing across the reels and substituting for all symbols except our Rainbow Scatter. We know that leprechauns are going to have a say in the dishing out of the gold in an Irish-themed online slot, and landing a Leprechaun Wild on reels 1 and 5 simultaneously launches the Emerald Isle Bonus Round, a pick ‘em style feature that greets us with a screen filled with treasure chests. A coin value lies inside each chest, and we can pick them until the Wolfhounds come home…well, until we match two of the same symbols, anyway. But that’s not all! NextGen not only delivers the luck of the Irish but also their famed generosity too. 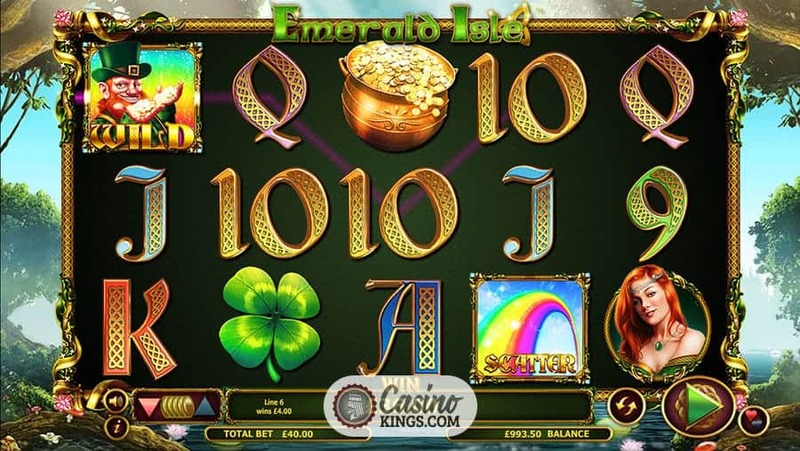 Emerald Isle’s second bonus feature is a Free Spins outing that launches 10 free spins when we land three or more Rainbow Scatters in a linear left-to-right pattern across the reels. All prizes are tripled during the free spins round, delivering plenty of potential for decent wins to have us scampering away from the Emerald Isle dropping coins on our way and giggling with glee. But how much glee is dependent on us. 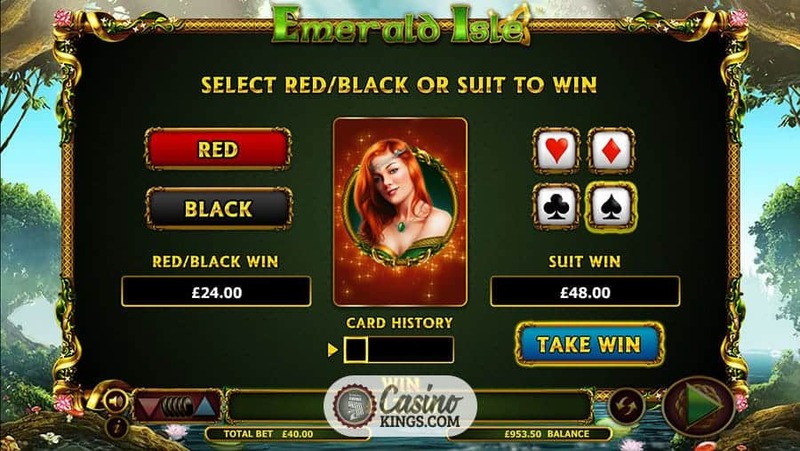 NextGen includes its trademark Gamble Feature in Emerald Isle that allows us to gamble on the flip of a card to double or quadruple our winnings, with the deck bedecked beautifully by the smiling face of our flame-haired Irish Maiden. Any online slot with two dedicated bonus features has to be worth a look, and when that title is developed with the finesse of Emerald Isle from NextGen Gaming we have all we need for a lilting tilt at Big Wins delivered with shamrocks, shenanigans and maybe a shriek or two.